Osmosis: the pressure created from the membranes is used through a turbine to generate electricity. The world literally pulled a little closer to a renewable energy future earlier this year, when Stein Erik Skilhagen doubled the efficiency of his prototype osmotic power plant in Tofte, Norway. For those not entirely up on the subject, osmotic power works on the textbook principle of osmosis: Basically, a dense solution pulls a less dense one towards itself. It's a powerful force of nature – trees use osmosis to draw water into their roots and send them on their way up to the highest branches. 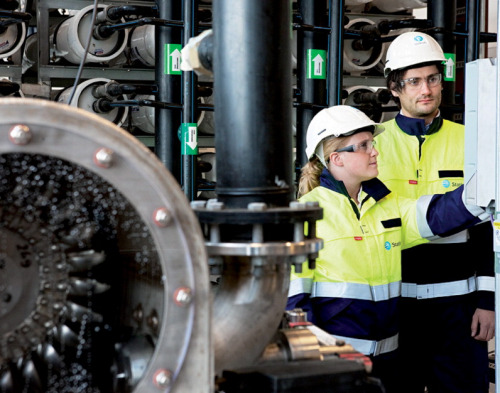 Skilhagen and his team at Norwegian State-owned utility Statkraft are tapping the enormous potential of osmosis to generate carbon-free electricity. Only they're not working with trees; rather, they're harnessing the energy released when freshwater meets dense salt water, as it does along coastlines the world over. Osmotic is one type of ‘salinity gradient’ power technologies. Statkraft's prototype plant funnels freshwater from the Tofte River and salty fjord water into two adjoining chambers separated with a thin permeable membrane. The freshwater forces its way through, driving up the level and pressure on the saltwater side, which in turn drives a turbine. Globally, osmotic power could one day generate 1700 TWh of electricity per year, the equivalent of roughly half of the EU's current consumption, estimates Skilhagen. He also hopes to commercialise the technology by 2015, though as with any research this depends on many factors. This month's milestone moment kept that journey on track. Skilhagen hailed in the New Year by replacing the polymer membranes he had been using since opening the prototype 15 months ago, with a thinner version. Impressively, he believes, this new membrane operates twice as efficiently as the original. The old one generated less than a watt of electricity per square meter of material. Although Skilhagen declined to specify the exact performance of the new stuff, figure it to be around 1.5 W/m2. Although a three-times improvement would have been even more impressive, Skilhagen said he is “definitely not disappointed.” The doubling is actually better than it appears, because this month's results come from using cold winter water, which stunts an osmotic process that works more effectively during the considerably warmer summer months. Statkfraft had taken its earlier sub-watt reading in October 2009, when the water would have been warmer and the osmosis more pronounced than in January. At 1.5 W, the process still has a long way to go to reach the 5 W that would, according to Skilhagen, make osmotic power economically viable. The challenge is to continue to develop new membranes that allow water to flow through at higher rates. Skilhagen hopes to start making more frequent strides, similar to January's advance, which came about 15 months after he first started operating the prototype. The next set of membranes should arrive before the summer begins, he said. Although he declined to quantify his expected results, he said the membranes would improve water flow. Globally, osmotic power could one day generate 1700 TWh of electricity pear year, the equivalent of roughly half of the EU’s current consumption. He also would not say what they'd be made of. The first membranes, he said, were “cellulosic.” The current ones are “thin film.” The next set will be one or the other. One stumbling block has been the relative scarcity of membrane suppliers. While Statkraft designs them, it doesn't make them. Its first membranes came from Germany's Microdyn-Nadir, the second from a different supplier which Skilhagen declines to identify. The good news, said Skilhagen, is that the community of suppliers is beginning to grow, and should grow more as osmosis inches closer to the market, and as more power companies get interested in it. Statkraft is one of only two companies known to operate an osmotic prototype. The other is a Japanese partnership of Kyowakiden Industry Co., Tokyo Institute of Technology and Nagasaki University, which is generating osmotic power in Fukuoka City. Utility Hydro-Québec in Canada has identified 12 GW of osmotic potential along the Hudson Bay, James Bay and St Lawrence estuary, which would add 25% to its capacity, although it doesn't anticipate opening any osmotic plant until at least 2020, according to Denis Faubert, General Manager of the Hydro-Québec Research Institute. Other organisations like the US Department of Energy (DoE), and space agency NASA have expressed interest. Although DoE is not actively pursuing osmosis at the moment, it is following developments. Alan Hoffman, a senior analyst in the Energy Department's Office of Energy Efficiency and Renewable Energy, notes that osmotic power could be a valuable fork in the world's multi-prong renewables march: “I'm glad there are people doing it. There are no silver bullets for our energy problem. We're going to need it all,” says Hoffman. NASA is interested in osmosis for generating electricity on spaceships, and also for water purification. The membranes are similar to those used in reverse osmosis (RO) desalination. Skilhagen envisions 30 osmotic plants around the world by 2030. That could happen as long as membranes continue to advance – besides allowing greater flow, they'll also have to become more durable. Current membranes deteriorate rapidly, whereas commercial quality will have to last for at least 7 to 10 years, noted Skilhagen. Of course, funding would also help. Statkraft has spent about US$25 million to date, about 30% of which has come from the Norwegian government and the EU. Skilhagen and his crew will compete against other renewable initiatives including better known ones like wind, solar and geothermal, and some of the lower profile technologies. There's even another “salinity gradient” technology called reverse electrodialysis, pursued by Holland's Redstack and others. Like with osmosis itself, the political funding process will involve a fair amount of pushing and pulling. Skilhagen and Stakraft will be hoping for more support along the way. Video: how the Osmotic Power Plant is built. Mark Halper writes for TIME and Fortune magazines, covering many aspects of clean energy.